Eggs are rich in proteins and other vital nutrients that are very good for the body. Hence it is advised by doctors to include this in our daily menu. I have shared several recipes with Eggs in my blog and you can check out the recipes by visiting this page. 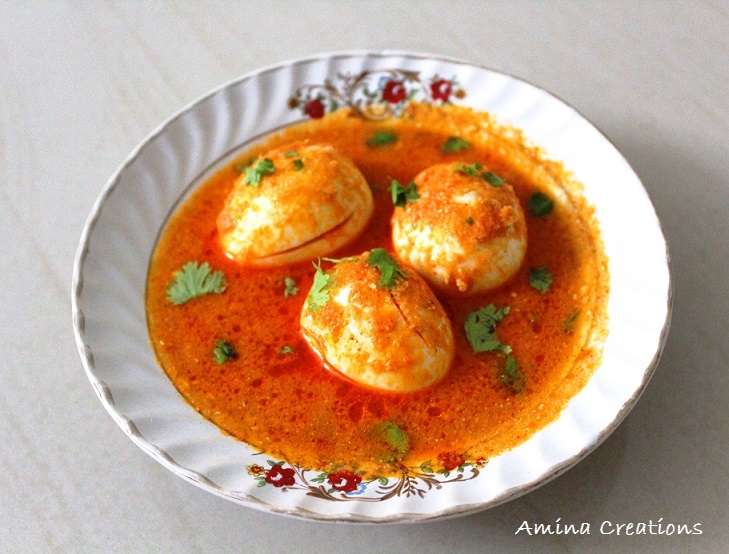 Today’s recipe is of an Egg curry or Ande ka khurma that is spicy, a little tangy and very delicious. 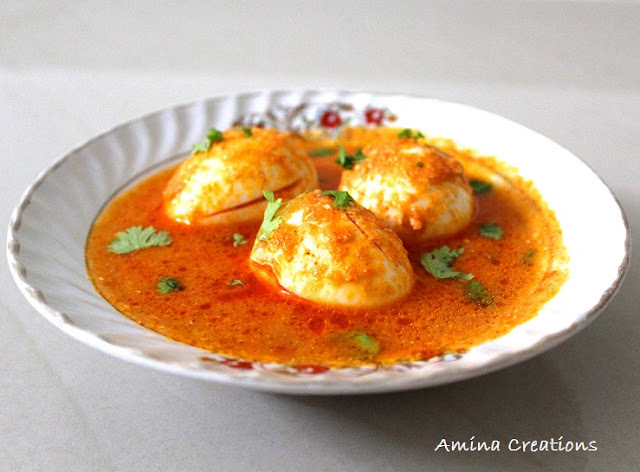 It is a tomato and curd based curry that goes well with chapathi or rice. Take the tomatoes and poppy seeds in a mixer jar and grind to a fine paste. Heat oil in a pressure cooker; add onions, cardamoms and cinnamons and saute till the onions turn brown in colour. Add ginger and garlic paste and sauté till the raw smell goes. Add red chili powder, salt, and the tomato poppy seeds paste and mix well. Continue cooking in medium flame till the raw smell of tomatoes goes and oil starts separating. Add coconut paste and curd along with coriander and mint leaves and mix well. Add 1 cup water and lemon juice and bring the curry to a boil. When all the steam has come out, open the lid and add the boiled eggs. Again cook for a couple of minutes in medium flame. Check for taste and add salt, chili powder or lime juice if required and boil for a minute. Switch off the gas, transfer to a serving bowl and serve hot. Delicious Ande ka khurma is ready.